Robert Mueller's Submission in Support of a Breach [of the plea deal] was filed late this afternoon. It outlines an incredibly brazen, and frankly stupid, attempt to evade justice, indicating a clear miscalculation of one's own ability to get away with crimes. DILANIAN: The Special Counsel is saying Manafort lied about his interactions with Konstantin Kilimnik. In previous filings it was said Kilimnik had ties to Russian intelligence. there's an individual's name blacked out in the filing and the Special Counsel alleged Manafort lied about that. Robert Mueller alleged Manafort lied about a wire transfer to a firm linked to Manafort, about another separate Department of Justice investigation that Manafort offered information about and lastly the Special Counsel says Manafort lied when he said he wasn't in contact with anyone from the Trump administration, it turns out he was up until May of this year and because of all of that the Special Counsel has canceled Manafort's plea agreement and he's facing 15 years in prison. MELBER: When you look at that line does that relate in your view or is it possible to say to obstruction or the potentially collusion-related things since Kilimnik is one of the potential Russian-linked handlers here? to Ken. MANAFORT: Oh, sorry. I mean, I think -- sorry, Ari, I thought you were talking to someone else. MELBER: I'm the anchor, I'm supposed to use names. That's on me. But to Ken Dilanian, can you glean what part of the problem that hits? DILANIAN: I think Kilimnik has been a mystery figure in terms of collusion and we don't know his role and it goes to the question of Manafort's role in any contacts with Russians during the campaign and because of the redactions, we don't see the full picture here. 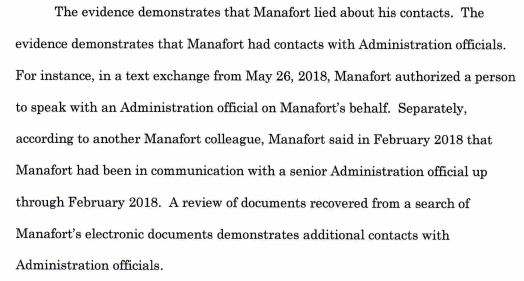 So not one, not two contacts, but "several contacts" with administration officials, which definitely fits with the story about Manafort's lawyer keeping Trump's people read in to what Robert Mueller's team was interested in learning about.